Press Release, May 22, 2018, Montréal. In conjunction with Budget 2018-2019, in which the Québec government announced unprecedented investments in the environment sector, $40.9 million in appropriations have been paid to the Ministère du Développement durable, de l’Environnement et de la Lutte contre les changements climatiques (MDDELCC) to ensure the efficient management and development of Québec’s network of protected areas. The Nature Conservancy of Canada (NCC), a not-for-profit conservation organization, welcomes the contribution of nearly $1 million from the Ministère du Développement durable, de l’Environnement et de la Lutte contre les changements climatiques to its Ecological corridors: a climate change adaptation strategy project. This amount comes from the Action-Climat Québec program, financed by the Fonds vert. From now until 2020, NCC and many regional and international partners will be educating communities about the ecological corridors that cross their region. These corridors consist of land and water passages that connect territories to each other. These so-called “connectivity” areas allow animals to move and plants to disperse to meet their needs. NCC’s collaborative project aims to mobilize the population to safeguard these ecological corridors. “The impact of climate change is putting increasing pressure on our ecosystems and all the species that comprise them. The project Ecological corridors: a climate change adaptation strategy by the Nature Conservancy of Canada in Quebec engages the community in implementing solutions to preserve our rich natural heritage. This is one of the objectives of the Action-Climat Québec program, funded by the Fonds vert: for local communities to take action to implement climate change adaptation strategies to ensure a richer and greener future for us all,” stated Isabelle Melançon, Minister of Sustainable Development, the Environment and the Fight against Climate Change. Connectivity between habitats is therefore essential to cope with these changes. Not only does it promote the survival of wild species, but it contributes to the well-being of the human population, for whom natural environments perform an infinite number of services. 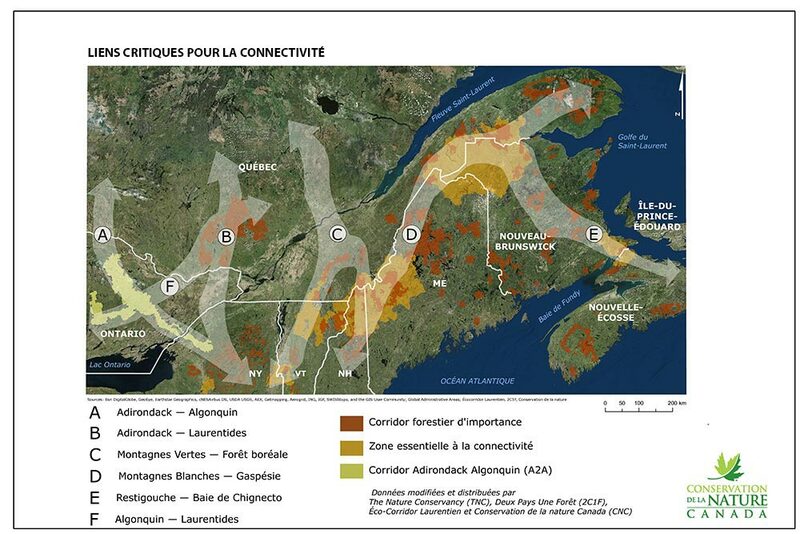 The project is being deployed in five regions of Quebec (see map). To cultivate a common vision for connectivity in southern Quebec, NCC works with key organizations: Appalachian Corridor, Éco-corridors laurentiens, Nature-Action Québec, the Conseil régional de l’environnement du Centre-du-Québec, Horizon-Nature Bas-Saint-Laurent, Two Countries One Forest, and the Staying Connected Initiative. NCC also recognizes the contribution of the Woodcock Foundation, whose landscape conservation program focuses on maintaining connectivity between Canada and the United States. “The Woodcock Foundation of New York and the Echo Foundation of Montreal are pleased to partner with the Government of Quebec’s Fonds vert to support the efforts of NCC and its partners to identify wildlife corridors that will become part of the green infrastructure vital to North America’s adaptation to climate change. We look forward to working with the Fond verts to secure this infrastructure as the next step for this initiative,” said Jeremy Guth, administrator at the Woodcock Foundation. NCC is also collaborating with an advisory committee made up of experts from various governmental and non-governmental organizations, research institutions, national parks, other land managers (including municipal and forestry representatives, among others) and citizens. Through its interventions, the project aims to bring about changes in behaviour and encourage communities to embrace the protection of natural corridors as a climate change adaptation solution. With this in mind, community activities will be held in the five connectivity zones in order to educate and involve the population, guide them in taking action, and seek solutions. Provide the targeted regions with a network of stakeholders who can maintain and enhance the corridors. The Action-Climat Québec program aims to mobilize the population in the fight against climate change. It supports social projects that encourage behavioural change and sustainable practices to reduce greenhouse gas emissions and adapt to climate change. Financed by the Fonds vert, Action-Climat Québec derives from priority 8 of the 2013-2020 Climate Change Action Plan. The Nature Conservancy of Canada (NCC) is Canada’s leading not-for-profit private land conservation organization, working to protect our most important natural areas and the species they sustain. Since 1962, NCC has helped to protect 2.8 million acres (more than 1.1 million hectares) across the country, including 111,197 acres (45,000 hectares) in Quebec. It is by securing and protecting these natural environments that they can be made accessible to this generation and those to come. The Québec government has completed all legal and administrative steps to officially establish this park, the 26th in Québec’s national park network,which will generate over $40 M in investments in Témiscamingue over the coming years andcreate some 30 new jobs. Opémican National Park occupies an area of 252.5 km2.. Environmentally speaking, this park helps achieve the objectives of the network of protected areas, particularly in southern Québec. It also supports the protection of part of the shores of Lac Témiscamingue and Lac Kipawa, Rivière Kipawa, several lakes, streams and wetlands, old-growth pine forests and various plant and wildlife species, including the Peregrine Falcon, a vulnerable species that nests in the territory.